Here are annotated images of the circuit boards to help with assembly. Click on them to get to a giganto version. 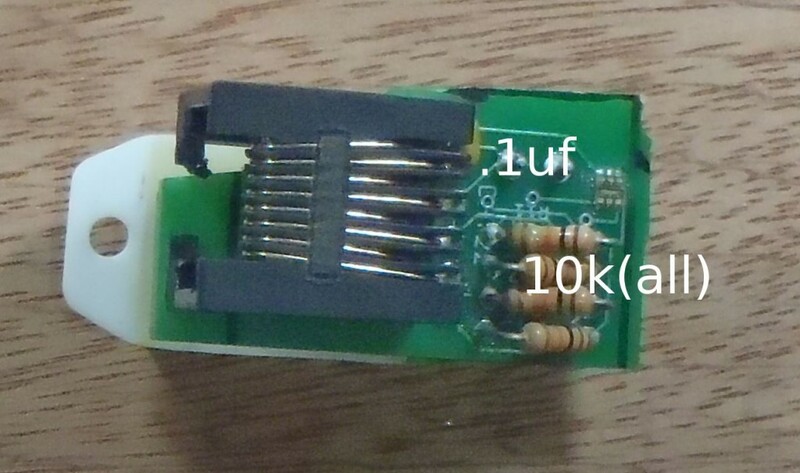 R2 is 10k, R7 is 1k, and all other resistors are 10k. C4 and C6 are .1 uF, and all other capacitors are 10uF. The capacitor is .1 uF, and all resistors are 10k. Please comment with any other questions on getting started with assembly; thanks for your patience! This entry was posted in Uncategorized on January 23, 2013 by luke iseman. I did not get how to upload arduino sketch on growerbot since i do not see any serial port. I see a group of pins “program”, do I need them to attach a serial and upload a sketch? When will be ready a kit like you old system? Where can I get a growerbot? I dont see any info on purchasing parts. Hi Zippy, I just added a buy now section. Thanks! The sensor doesn’t seem like it’d last outside very long. Is this an indoor only system? I’m a bit confused as to the orientation of the LCD display and connecting board…do you have any clear pics about how they all fit together? I think I messed up on my orientation…thanks. Maybe there’s some documentation out there that I missed? Check out the video and discussion here: http://www.growerbot.com/2013/02/03/growerbot-kit-assembly-videos/ . If that doesn’t clear things up, let me know and I’ll take some more photos. When trying to bootload the chip. I’ve tried modifying the avrdude and nothing. Any advice? 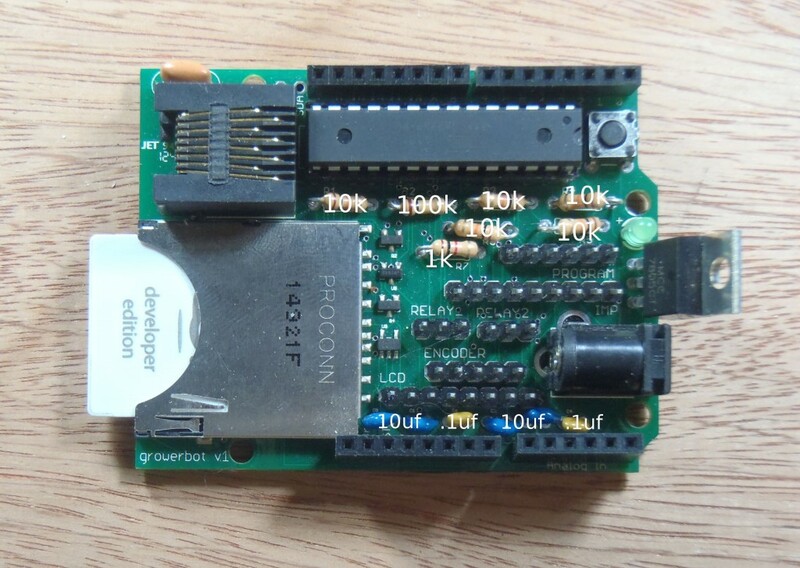 Have you tried programming the chip in a normal arduino? If this still doesn’t work, let me know and I’ll send you a preprogrammed replacement. Would you mind sending me a chip – so sorry. Hi Luke- Were you able to send this replacement ? Thanks! Thanks for your patience, and please let me know when you get it working! I’d be happy to send you a replacement. If you take and post pictures of the lcd assembly process, I’ll cover the cost. Same address as for the paypal order, right? Let me know if you need more detail to assemble the lcd. Hi Luke, That would be great, sure, happy to take some pics of the (correct) assembly process. I assembled with the silk screen of the lcd mount board facing the same way as the LCD. Much appreciated, and yes, same shipping address as my PayPal order. Thanks for posting this. I’ve put together a basic board and was surprised to find the GND terminal of the 7805 is connected to the center barrel power pin. Any idea why the power was done this way ? I was following your video instructions for programming the growerbot. I got the blink program to work. I don’t have an FTDI Cable, so I was going to upload the gbot1219.ino file as I did with the blink program. I’m only basically familiar with programming an Arduino. What do I need to do to fix these errors? Hi, I found the answer from Luke’s post elsewhere in the forum. I am thinking of using the growbot for a window farm project I am directing for a group of high school students.